My 11-year-old son is an expert social media marketer. At age nine, he started out as a player on Club Penguin and quickly became hooked on Club Penguin blogs. He then started his own blog and set up his own domain name and wordpress blog, twitter account and Skype account. Pretty soon his blog was getting 1000 hits per day. He had a loyalty program set up and guest bloggers (all kids aged between 9 and 17) that he collaborated with via Skype. He started making movies for Youtube and set up a Youtube Channel. As his interests have changed and developed he’s shifted focus but essentially, he’s mastered the art of social media marketing, simply through a process of experimentation. My son’s “business” at the moment is setting up a server on Mine Craft. He collaborates with about 5 other kids from various parts of the globe and soaks up as much information as he can to aid the process. I think sometimes we over think how to use social media for our businesses. It is easy to get caught up in the numbers and sales and forget that really, it’s about connecting and conversing, sharing and experimenting. I’ve noticed that my son uses twitter as a conversational tool. It’s something I’m just starting to use more myself now that I have my iphone4s. Twitter is really handy for events. You just nominate a #topic and let people know that’s where they can find a particular thread and voila, you have a conversation going. The other take-away I’ve had from observing how my son uses social media is that anyone can learn how to use and integrate their social media platforms. There are tools that help you do it so that you’re not going out of your mind trying to keep up with the different platforms. Tweetdeck is one! Whatever you do, aim to use social media productively. You don’t need to be on Twitter 24/7 to make it work for your business. You could simply use it for events or public discussions. You also don’t need to be on Facebook 24/7 in order to increase your engagement. Even if you respond to a post a few hours later, that person will still see your response and will appreciate that fact you’ve responded. If you want a bit more privacy, another useful conversational tool is Facebook Groups. We have set up a closed group for our Support a work at home members and sponsors and it has been a great tool for connecting with each other, supporting each other with useful resources and information and networking. If you run a business that involves several people and you want to discuss issues privately, you can set up a secret group on Facebook. However, just a note of caution, some people have been setting up groups as yet another way to sell to people. I would discourage that practice. People switch off anything that sounds like noise and if they are subscribed to a group without realising it and it ends up being a sales thread, you will lose potential customers and clients. Social media can seem daunting but once you get into it and start learning how to create compelling content and inspiring conversations, your business will organically attract fans that may one day buy from you. The reason why twitter and Skype work so well for my son is because he’s not focused on selling anything (even though he’d like to earn money from his projects) but rather on learning from and participating in a creative community with similar passions. Social media really is child’s play if we stop trying so hard to market our stuff and just join in the conversation. Great post. People often use Facebook for advertising and for their business. They have missed the point of socializing with close friends and building good relationships with people. 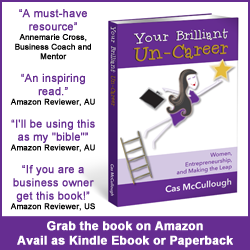 Get Your Brilliant Un-Career on Amazon!